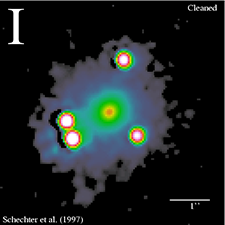 The Einstein Cross is an excellent example of a probable quadruple quasar system described as a distant gravitational lens by current mainstream scientists. In fact, there are many good examples of multiple quasars that surround and even appear to be ejected from dimmer, lower redshift central galaxies. But unfortunately these objects too have been explained away as gravitational lenses, despite their lack of correlation with any known optical physics. Take for instance PG1115+080 near the constellation Leo. This object also consists of four quasars surrounding a dimmer, lower redshift core. This central host galaxy displays a redshift of 0.31 z which supposedly places it over 2.9 billion light years away using a so-called Hubble Constant value of 85 (km/s)/Mpc. The four quasars display identical redshifts of 1.7355 z each which supposedly place them at a much greater distance of almost 8.3 billion light years also using a so-called Hubble Constant value of 85 (km/s)/Mpc. Interestingly enough, most images of PG1115+080 show a tenuous connection between the central galaxy and one or more of the surrounding quasars, despite their accepted separation of over 5 billion light years. In the above images from the 8.2 meter Subaru Telescope at the Mauna Kea Observatory in Hawaii filaments of various thicknesses are shown connecting the central galaxy with all four of the surrounding quasars! The following image on the left is from the CfA-Arizona Space Telescope LEns Survey (CASTLES). CASTLES utilized Hubble Space Telescope optical and near infrared images using NICMOS/NIC2 for H band observations and WFPC2/PC1 for V and I band images when otherwise unavailable. The image also shows all four quasars connected to the central galaxy via tenuous bridges of material. 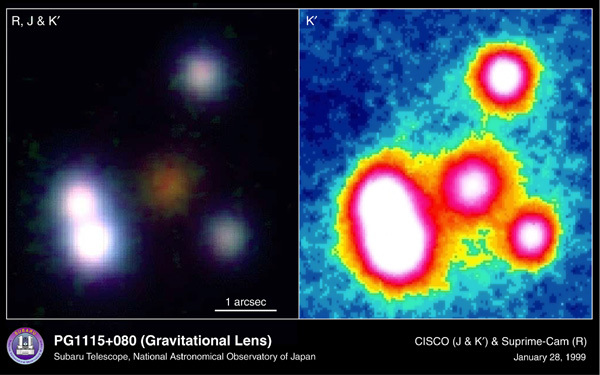 Even after the image is “cleaned” using image filtering software based on hypothetical gravitational lens models the two paired quasars at the lower left of the image on the right still display strong connections while very faint filaments are still visible between the other two quasars. Despite this evidence there are still scientists who try to manipulate the data. 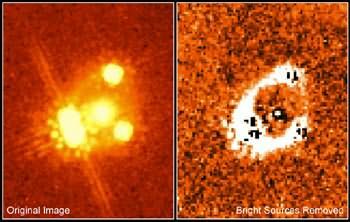 The pair of infrared images on the left is taken from the Hubble Space Telescope NICMOS. The left image is the original while the right image has supposedly had the quasars and central galaxy digitally subtracted from it to reveal a lensed galaxy in the background. There are a few problems with this processed image however. Besides the dubious method of subtraction used to create the image, the resulting ring of light is incomplete and irregularly shaped and does not conform to any accepted optical physics or gravitational lens models. The image to the right is a 7+ hour exposure of PG1115+080 made by the Chandra X-Ray Observatory. If the light from a background quasar and its host galaxy is supposedly being lensed and is showing as a ring in infrared and possibly visible wavelengths why is there no trace of the hosting galaxy when it is viewed in the x-ray portion of the electromagnetic spectrum? The most likely explanation is that there is no real ring nor any gravitational lensing occurring at all other than what scientists so desperately wish to see rather than face the stunning reality of their observations. If the four quasars encircling the central galaxy in PG1115+80 are not the result of gravitational lensing then what can account for their number and positioning? Why are quasars typically only located in a limited number of positions around the central galaxy in other compact quadruple quasar systems? One very interesting theory is that these quasars have been ejected from the central galaxy in a symmetrical tetrahedral pattern. The various filaments and connections observed between the quasars and the central galaxy in PG1115+80, the Einstein Cross and other quadruple quasar systems appears to confirm the ejection part of the theory. But I must admit I have always had trouble visualizing a tetrahedron configuration for the quasars in these compact systems. That was until one of my readers posted a comment under the Einstein Cross example. He suggested the humble methane molecule as a visual aid for tetrahedral symmetry. Of course it is not being suggested that methane plays any role in quadruple quasar systems. But the four hydrogen atoms that surround the central carbon atom in methane are positioned at the vertices of an imaginary tetrahedron orthographically projected from the central carbon atom. By rotating this tetrahedron the hydrogen atoms can be positioned so that they align themselves very closely with the majority of the quasar positions observed in compact quadruple quasar systems such as PG1115+80 and the Einstein Cross. The best way to view these alignments is to utilize a Java applet such as Jmol that allows viewing and manipulation of various molecules in orthographic perspective. The easiest way to accomplish this is to search for “JMOL methane” in any search engine. This query will return a variety of pages displaying the methane molecule in an embedded viewer. 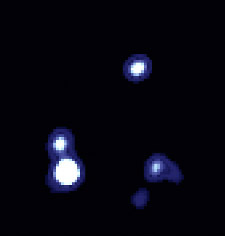 By rotating the methane molecule displayed in one of these Java viewers I was able to line up the angles of the hydrogen atoms to almost precisely match the angles of the quasars surrounding the core of PG1115+80 in the above observations. 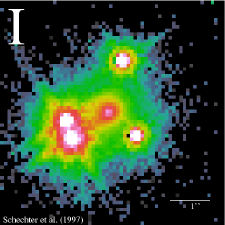 Any variance from the resulting image on the left is possibly due to the viewing angle and/or independent motion of the quasars since their ejections from the core. I was also able to rotate the methane molecule to align its hydrogen atoms precisely with the positions of the quasars shown in the Einstein Cross. Please be sure to visit this previously posted example to view the newly added resultant image. So if the aforementioned objects are indeed formed by the ejection of quasars in a symmetrical tetrahedral pattern from a central galaxy why this particular pattern? I proffer that the answer is simplicity. A tetrahedron has the least number of faces and angles of any geometric solid. Therefore, other than a pair, the least number of objects that can evenly encircle a central object with matching angles is four and only if they are positioned at the vertices of a tetrahedron. There are many more examples of tetrahedral symmetry displayed in compact quadruple quasar systems. I plan to post several more of these as time permits. In the meantime continue to question the accepted theories, doubt the explanations given, and search for the truth about our universe and modern cosmology. Thanks for reading! This entry was posted on Thursday, February 2nd, 2012 at 11:26 pm	and is filed under Redshifts, Tetrahedral Symmetry. You can follow any responses to this entry through the RSS 2.0 feed. You can skip to the end and leave a response. Pinging is currently not allowed. A very interesting set of objects! I spent a good while tracking down various papers and websites, and reading them. By the way, did you know that the latest Zooniverse project – Space Warps (http://spacewarps.org/#/home ) – is specifically designed to look for gravitationally lensed objects? * “despite their lack of correlation with any known optical physics” – I don’t know what you were intending to explain, but the physics of gravitational lensing is well understood and well tested. * “Interestingly enough, most images of PG1115+080 show a tenuous connection between the central galaxy and one or more of the surrounding quasars,” – if you have a chance, it might be interested to find images of a small elliptical galaxy, in SDSS, with two or more brighter stars close by. There is no physical connection in these cases, yet I expect you’ll find something looking very much like “a tenuous connection”. This is an artifact of the imaging system (telescope optics, camera optics, camera detectors) and environment (atmosphere). Of course, there could still be a tenuous connection! However, it would likely not be easy to show convincingly that it’s real (and not an artifact). * “Besides the dubious method of subtraction used to create the image” – what’s dubious about it? * “the resulting ring of light is incomplete and irregularly shaped and does not conform to any accepted optical physics or gravitational lens models.” – it’s that shape (etc) because the lensed object (quasar and its host galaxy) are not perfectly aligned with the lens (the z=0.31 elliptical galaxy). In the papers I read, the lens models re-create the observed image pretty well. * “If the light from a background quasar and its host galaxy is supposedly being lensed and is showing as a ring in infrared and possibly visible wavelengths why is there no trace of the hosting galaxy when it is viewed in the x-ray portion of the electromagnetic spectrum?” – this is a very good question! I think the answer is that galaxies do not look like galaxies when imaged in the x-ray band; instead, they have a bright core (the nucleus) and one or a few other bright points (objects like high-mass x-ray binaries). To expect otherwise would be something like expecting the Sun to be by far the brightest object in the GeV (gamma ray) sky, because it’s the brightest object in the optical/visual/infrared sky (the Sun is almost invisible in GeV gammas, except when there’s a really powerful flare). Your ‘tetrahedral symmetry’ model is an interesting one, and it may be that when a point source is lensed by an object like a symmetric elliptical galaxy, the resulting images will display this sort of symmetrical arrangement. If so, this may be a useful heuristic for explaining gravitational lensing to students. I am familiar with Space Warps but unfortunately it trains participants to spot gravitational lenses using flawed examples. I consider the subtraction method used in the example image I posted to be dubious because it does not equally follow the light intensity of the image. It seems to almost be forced in an attempt to create a crude ring. Nevertheless, even if you accept the subtraction method, the ring that is formed does not follow any shape that would be predicted by accepted optical physics or any gravitational lensing models except for those created to try to simulate what is already observed. Groups of two or more points of light are also not predicted by known optical physics or lensing models. Light from a lensed object will appear as arcs, not points, when not perfectly aligned with the lens. See the HST images I included with my post of the Einstein Cross for examples. As for the apparent connections being artifacts, if this were the case why do they appear in separate images taken by different instruments in different wavelengths, even after being “cleaned”? Galaxies actually do look like galaxies when viewed in the X-ray band. Please see http://astrobites.org/2012/09/10/the-mystery-of-ultra-luminous-x-ray-sources/, http://www.flickriver.com/photos/nasamarshall/3765799902/ and http://chandra.harvard.edu/photo/2009/n604/ for some quick examples. If there really is a lensed ring of a host galaxy detectable in visible and infrared wavelengths it should also be visible in x-rays. What method would you suggest should be used to spot gravitational lenses then? “the ring that is formed does not follow any shape that would be predicted by accepted optical physics or any gravitational lensing models except for those created to try to simulate what is already observed.” – I’m puzzled by this; could you explain in a bit more detail please? In general, isn’t this the approach used in just about every part of astrophysics? For example, to describe the distribution of light across an elliptical galaxy, don’t you create an analytic model, and tweak the values of the parameters in it until they give the best match? “Groups of two or more points of light are also not predicted by known optical physics or lensing models.” – do you have a reference for this? “As for the apparent connections being artifacts, if this were the case why do they appear in separate images taken by different instruments in different wavelengths, even after being “cleaned”?” – I don’t know, but I myself can’t see the connections consistently; have you considered doing your own quantitative image analysis, to show these? In any case, a ‘null test’ is clearly called for, I feel. Yes, I should have written that galaxies *usually* do not look the same – morphologically, etc – when viewed in x-rays. The Chandra pages provide a wealth of good examples: you can see some vague spiral structure in the lowest x-ray band in some images, but in many the pattern of ‘x-ray light’ is quite different from that of ‘visual light’. In the case of quasars – or AGN in general – the nucleus is almost always overwhelmingly brighter than the rest of the galaxy, in x-rays, while it is not always brighter in the infrared (or not always so overwhelmingly brighter). Also, given the high redshift, the soft x-rays detected would be hard, in the emitted frame, and the contrasts are even greater for hard x-rays than for soft. “If there really is a lensed ring of a host galaxy detectable in visible and infrared wavelengths it should also be visible in x-rays.” – it might be worth doing some quantitative analyses to show this. Just because a certain analytic model closely matches an observation does not necessarily mean that model could ever exist in reality. In a true gravitationally lensed system the background object or objects are only visible as rings or arcs. No I am not referring to the odd number theorem. This is a mathematical construct and an incomplete explanation at best.